Water Soluble film can be used ideally as topping film for embroidery because of its properties of stiffness, tear resistance, and water solubility. By using water soluble PVA film as the proximal cloth time can be saved more than by using a paper. you can wash away the film wituout damaging the cloth. PVA film increases dimensional stability, you can make more beautiful embroidery. 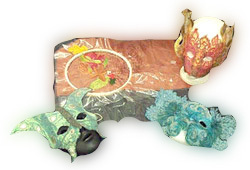 Water-soluble PVA film used in embroidery has advantages over other films. It is non-toxic and can be dissolved totally, it doesn't result in producing wire-drawing, nodal point, wire-break, offset direction etc. It is fit for multi-head embroidery machine. It takes place of non-woven fabrics as it can avoid textile's deformation and fading in high temperature.